The wall hanging that I came up with has a stair-step shape, with a bit of a southwestern feel and fun tassels as a finishing touch. And today I'm going to share the simple tutorial with you! Begin by cutting 20 straws in half using a sharp pair of scissors. Fold them all in half and lay them out as shown above, with the 44 inch long pieces in the middle, the 35 inch long pieces surrounding them and the 26 inch long pieces on the outside. 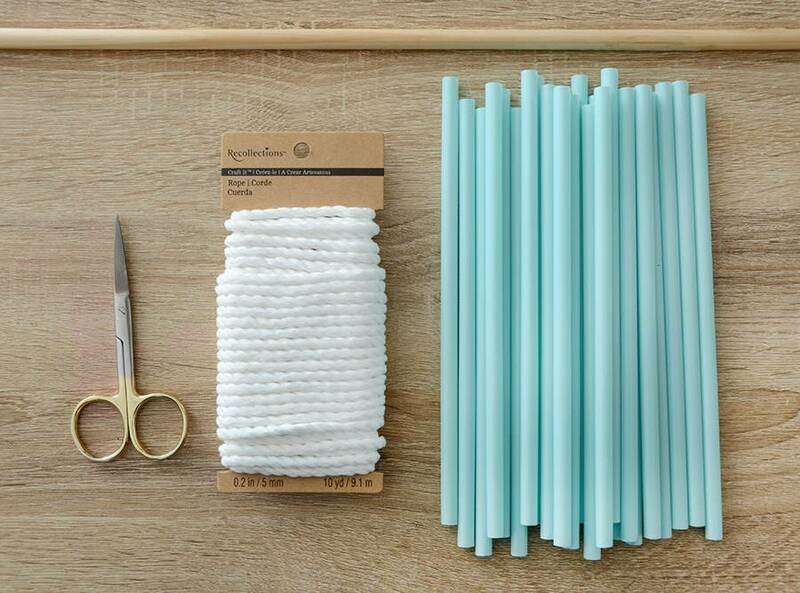 Beginning in the middle, pull the folded sides of the rope underneath the dowel and slip the cut ends through them to attach them to the rod. Do this for every piece of rope. Slide the straws onto the bottoms of each of the ropes, and tie a knot underneath each one. Leave the knots loose so you can make each section even all at once. Use a fine tooth comb to brush out the ends of the ropes. This will create a fluffy tassel on the bottom of each rope. Trim the ends, so each section is the same length. Last, cut a 24 inch piece of rope to create a hanger. Tie one end to each side of the dowel rod. And you're finished! Who would've thought that IKEA drinking straws could look so chic? The shape and the blue color give it a bit of a southwestern feel, while the crisp white rope makes it look quite contemporary. You could experiment with the shape and color scheme of this piece... how about using different colored straws or a triangle shape? The possibilities are endless!